Recipients of 15 State Library Victoria Fellowships worth a total of $200,000 were announced today. The 2017 Fellows include authors, artists, scholars and historians who will explore a diverse range of projects – from a digital personal timeline of Victorian history, to a series of artworks about childhood in Japan. For 15 years the State Library’s Fellowship program has been one of the most substantial programs of its kind in Australia. It has furthered the work of more than 200 artists, playwrights, writers, poets, historians, composers, and academics and has delivered over $2 million in funding. This year six creative and nine specialist Fellowships were awarded for projects that span topics including: early crime fiction, Melbourne’s live music scene, feminist history, digital innovation and poster art. CEO Kate Torney said the Fellowship program supports a diverse range of creative work and research. “The State Library Fellowships enable the Library to support our creative and scholarly communities through significant investment. They provide time, space, money and the expertise of Library staff to help unlock the collection and bring exciting projects to fruition,” Ms. Torney said. Past Fellowships have produced major exhibitions, public art installations, documentaries, books, graphic novels, plays, musical scores, interactive games and many other creative projects. 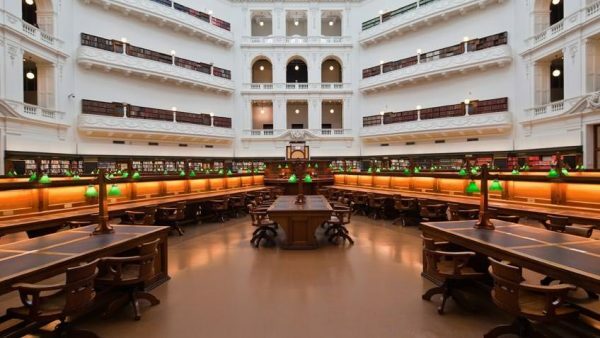 The Fellowships are funded by the State Library Victoria Foundation and other program partners, and are awarded annually on the advice of independent expert panels. Five funded fellowships and one honorary fellowship have been awarded to artists and scholars for developing innovative ways to express the Library’s collections. Dr Kelly Gardiner: ‘Sisterhood: Feminists in the Family’ – a work of history and memoir tracing two generations of Victorian women. Martin King: ‘Where the wildlife falls’ – a series of etchings and an immersive virtual reality environment that explore and evaluate the native flora and fauna in William Strutt’s painting, Black Thursday, February 6th 1851. Texta Queen: ‘Poster child’ – a series of artworks to be made into a poster series contextualising the experiences of marginalised diverse artists in contemporary Australia. Dr Robert Reid: ‘Mostly Untrue (The Exaggerated Life of George Coppin)’ – a new play script that explores the life and career of one of the founders of live theatre in Melbourne. Dr Lucy Sussex: ‘The Mean Streets of Old Melbourne: the Crime Writing and True Crime of Mary and George Fortune’ – a research project on Mary Fortune, a pioneering detective author in the late 1800s and her criminal son, George. Yasmin Kelsall: ‘Private Property’ – an exploration of human influence on the Victorian landscape’, a research project exploring themes that have shaped Victoria, the most cleared state in Australia. In association with the Baldessin Press, the Amor Residency at St. Andrews is available to a visual artist wishing to explore works on paper, in particular printmaking or artists’ books. The offer may include accommodation, printmaking tuition/technical support, materials or editioning and is funded by Rick Amor. Kyoko Imazu: ‘Following the secret hiding spots – exploring childhood memories and imagination’ – a series of prints and an artist book that explore the artist’s childhood growing up in Japan. For works exploring a subject related to Victorians at home and abroad during WWI and its aftermath. Deborah McKay: ‘Patsy Adam Smith: The Anzac Interviews’ – a series of six podcasts based on the oral history collection of interviews of WWI veterans recorded by Patsy Adam Smith from 1976-78. For the exploration of children’s book publishing, writing or illustrating. Dr Lili Wilkinson: ‘The Wild Kindness’ – a young adult novel that confronts the trope of the missing girl and restores agency to the lost girls of literature in a postmodern feminist reclamation. For the exploration of digitised collections, datasets, or iconic physical items using digital technologies. Natalie Wallis and Anthony Mockler: ‘My Victorian Story’ – a hyper-personal timeline of Victoria that maps key historical moments in the state’s history against a user’s family history. For research with a particular emphasis on the reign of King Charles I and the English Civil War. Dr Gordon Raeburn: ‘Weaponised Emotions and their use in Civil War Tracts and Pamphlets’ – an investigation of the presence and use of emotions in the extensive collection of Civil War tracts and pamphlets contained in the Emmerson Collection. For research on Victoria’s colonial history immediately before and during Lieutenant-Governor Charles La Trobe’s administration. Dr Monique Webber: ‘La Trobe’s Garden City and the Lost Sculptures of Fitzroy Gardens’ – explores La Trobe’s vision of formalised civic gardens and the Fitzroy Gardens lost classical sculptures. This research will result in written, oral, and visual outcomes and will include a walking tour of the gardens. For research into an aspect of the performing arts in Victoria. Andrew Watt: ‘Melbourne Live Music (1987-97) – From the Pages of InPress Magazine’ – investigates the evolution of the Melbourne live entertainment scene across a decade through the pages of Inpress magazine. This project will result in a publication and podcast series. For a contemporary artist to study, experiment and explore fresh thinking in their art. Catherine Evans: ‘The View from Mount Disappointment’ – will result in a large scale installation and an artist book that explore new cross-disciplinary connections between historical documents and how place and history are remembered. For the production of literary works. This fellowship allows for 3-6 months’ research and is funded in association with The University of Melbourne. Dr Luke Keogh: ‘Garden State: the Wardian case, Victoria and the Global Nursery Trade’ – explores the Wardian case, a portable greenhouse used for moving live plants that revolutionised the movement of live plants around the globe. This research will result in a scholarly article and a chapter in Luke’s forthcoming book. What a wonderful opportunity to explore the history of he world you live in for such a short period of time. Why are there so many fellows who already have doctorates? Are there no undoctored applicants?